There is no question that the resurrection of Jesus Christ stands alone as the most pivotal moment in human history. God Almighty, The Promise keeper of all promise keepers, kept His Word and infused the corpse of His only begotten Son with new life, thus honoring his obedience unto death. In so doing, God set the stage for the Lord Jesus Christ to pull off what is actually the second most monumental event in the history of mankind, but which has not gotten the “publicity” it deserves, even among Christians. What, you may ask, could even be in the category of Christ’s resurrection, let alone a close second in significance? That is an excellent question, and one that this article will answer via an exposition of Acts Chapter 2, which records this cataclysmic event. Hint: as via his resurrection Jesus Christ received new life, so this other epic occurrence has to do with him passing on what he had received (Acts 2:33) to another “man,” the “one new man” of Ephesians 2:15, the Church. As we go through Acts 2, we will note many great truths we simply cannot elaborate upon due to lack of space. The Day of Pentecost, as recorded in Acts 2, is the birthday of the ekklesia. That is the Greek word translated “church,” and it means a “called out group of people.” As we will see, it was on that Pentecost that human beings were for the very first time “born again” of “incorruptible” seed (1 Pet. 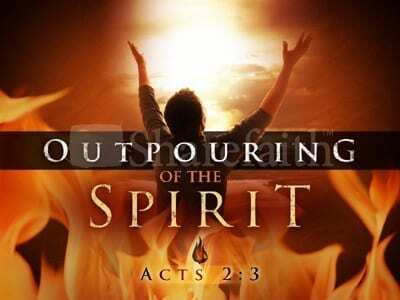 1:23 – NKJV) via being “…baptized by one spirit into one body…” (1 Cor. 12:13). That “Day” was the beginning of the Administration of the Sacred Secret (Eph. 3:9), and ushered in a new age, one that was literally undreamed of by anyone theretofore. (6) However, we speak wisdom among those who are mature, yet not the wisdom of this age, nor of the rulers of this age, who are coming to nothing. (8) which none of the rulers of this age knew; for had they known, they would not have crucified the Lord of glory. Talk about not getting enough publicity—that last verse has been given short shrift in Christendom for sure. Had Satan and his henchmen known what God had up His sleeve, they would have allowed Jesus to live. Think about that. The Devil is pure hatred, and the moments of his greatest satisfaction were when he gleefully tortured and murdered Jesus. But had he known that after his resurrection Jesus was going to diversify himself all over the world via a body of believers, each permanently filled with his spirit and thus equipped to be like him and do what he did, he would not have crucified the Lord of glory. So let us go to God’s matchless Word and revel in its magnificence as we go through Acts 2. (1) When the day of Pentecost came, they were all together in one place. (2) Suddenly a sound like the blowing of a violent wind came from heaven and filled the whole house where they were sitting. (3) They saw what seemed to be tongues of fire that separated and came to rest on each of them. You can go to Exodus 23:16 and elsewhere to see that Pentecost was one of the three main Jewish holidays that God, during Old Testament times, commanded His people to observe each year. It was to celebrate the first fruits of the yearly harvest, when the people were to rejoice in God’s goodness in providing for them. Jews from all over the world were required to come to Jerusalem for Pentecost, and the Temple, the place where God met His people, was where they gathered. That is where what we are about to read took place. In verse 2, I believe there is a most significant aspect to the “…sound like the blowing of a violent wind….” In Genesis 2, God first formed Adam out of the dust of the ground and then breathed into him the breath of life, and Adam became a living person. So too, on that Day of Pentecost, God, via the Lord Jesus, breathed life into the “one new man,” the Church, the Body of Christ. Even as Adam was to have produced perfect offspring, so Christians are to reproduce themselves by sowing the good seed of God’s Word in the hearts of men. (22) And when He had said this, He breathed on them, and said to them, “Receive the Holy Spirit [no article “the”—read “holy spirit”]. I used the New King James Version to show that the italicized word “them” is not in the text. After his resurrection, Jesus’ main job was to prepare his disciples for the outpouring of holy spirit, which was not available until after he had ascended to God. Therefore, he was not telling them they were receiving it that day. What I believe happened in the above record was that Jesus breathed deeply and audibly, and made it clear to them that there would be such a sound when they actually did receive holy spirit. As for the visual cue, the disciples surely remembered the spiritual significance of fire, as set forth in Leviticus. It signified the presence of God, a cleansing, and God’s acceptance of an offering. So, when they heard the sound of a mighty wind filling the Temple and also saw, as it were, tongues of fire above the head of each disciple present, they realized that this was the moment for which they had been waiting. And what happened then? All of them were filled with the Holy Spirit [no article “the”—read “holy spirit”] and began to speak in other tongues as the Spirit enabled them. It is extremely significant that immediately after their New Birth, the first people ever to be born again spoke in tongues. A study of Scripture shows that speaking in tongues is the only absolute proof one has that he is born again and guaranteed everlasting life. It also shows that Acts 2 set the pattern God desires, which is that everyone who gets saved speaks in tongues right away. Verses 5 through 13 say that the Jews gathered at the Temple from all over the world were flabbergasted to hear Galileans not only fluently speaking their languages, but also “…declaring the wonders of God….” When they asked one another, “What’s up with this?,” some of those obviously on crack said that the reason why the disciples were suddenly fluent in new languages was that they were drunk. Let’s analyze that statement. Does too much alcohol lead to fluency in other languages? No, it leads to a lack of fluency in your own language. Then Peter, the same Peter who had denied Jesus, the same Peter who was hiding behind closed doors for fear of the Jews, stood up before those same Jews and many others, raised his voice, and laid out the stirring speech that we will now look at. And his eleven fellow disciples stood up with him. Think about what this band of brothers had been through together. And now they rose as one before the multitude to take a stand for their risen Lord. Would to God that you and I do no less today. (14) Then Peter stood up with the Eleven, raised his voice and addressed the crowd: “Fellow Jews and all of you who live in Jerusalem, let me explain this to you; listen carefully to what I say. (15) These men are not drunk, as you suppose. It’s only nine in the morning! (17) “ ‘In the last days, God says, I will pour out my Spirit on all people. Your sons and daughters will prophesy, your young men will see visions, your old men will dream dreams. (18) Even on my servants, both men and women, I will pour out my Spirit in those days, and they will prophesy. (19) I will show wonders in the heaven above and signs on the earth below, blood and fire and billows of smoke. (20) The sun will be turned to darkness and the moon to blood before the coming of the great and glorious day of the Lord. Eventually we plan to write a book on the administrations in Scripture, and in it we will elaborate on this record. For now, suffice it to say that because there is absolutely nothing in the Old Testament about the Administration of the Sacred Secret, we know that Peter could not have been saying that what was taking place that day was what Joel had prophesied. Rather, his mind went to the only section of Scripture that he could connect with what he and the others had just shockingly experienced, and he said, “Here is what Joel said…” or “Let me tell you what Joel said…” If you look at verses 17–21, you will see that what Joel prophesied is still in the future. On that day, Peter had no knowledge of the Sacred Secret, which was later to be unfolded to the Apostle Paul and recorded in the Church Epistles. The Sacred Secret was that Peter and his compatriots were that day the first members of the Body of Christ, the most unique group of people who had ever lived—not Jews, not Gentiles, but “one new man” (Eph. 2:15), a body of believers filled with the spirit of God and thus permanently born again of God’s spirit and guaranteed everlasting life in Paradise. The reason why the Joel record was at all applicable was that the Church now gets to partake of the holy spirit aspect of the New Covenant blessing (e.g., Ezek. 37:11–14). What all Old Testament saints will have after the Resurrection of the Just, we have now. They will have it in new bodies, while we have it now in earthen vessels. How awesome! Looking ahead to Acts 2:41, we see that about 3,000 people were saved that day. In the Church Epistles, we find that Romans 10:9 contains the “formula” or “faith components” for salvation in the Church Administration: one must confess Jesus as Lord and believe that God raised him from the dead. For those 3,000 people to be saved, therefore, whatever Peter said in verses 22–40 of Acts 2 must contain those components—that Jesus is Lord and that God raised him from the dead. Let’s see. (29) “Brothers, I can tell you confidently that the patriarch David died and was buried, and his tomb is here to this day. (30) But he was a prophet and knew that God had promised him on oath that he would place one of his descendants on his throne. (31) Seeing what was ahead, he spoke of the resurrection of the Christ, that he was not abandoned to the grave, nor did his body see decay. (32) God has raised this Jesus to life, and we are all witnesses of the fact. (33) Exalted to the right hand of God, he has received from the Father the promised Holy Spirit [holy spirit] and has poured out what you now see and hear. Peter referred to Psalm 110, a vivid picture of the exalted Messiah ruling the world at the right hand of God, and then declared that God has made this Jesus, the man they had killed, the anointed Lord. In the face of such profound truth, the people were “cut to the heart” and asked what they should do? (38) Peter replied, “Repent and be baptized, every one of you, in the name of Jesus Christ for the forgiveness of your sins. And you will receive the gift of the Holy Spirit [no article “the”—read holy spirit]. (41) Those who accepted his message were baptized, and about three thousand were added to their number that day. Still ignorant of the Sacred Secret and all the changes in the new administration of which he had just become a part, Peter exhorted the people to be baptized in water. What he did not then realize was that when they believed what he said about the resurrection and lordship of Jesus Christ, they were baptized on the inside with the gift of holy spirit, which was permanently shed abroad in their hearts. And at that glorious moment, the Christian Church, the purpose of the ages, that for which God had waited about 4,000 years since Adam and Eve had trudged dejectedly out of Paradise, was born. As we conclude this article, let us look briefly at how the newborn Church grew in both quantity and quality, because the same pattern for healthy growth still holds true today, and we can emulate it with similar success. As the following verse shows, at the root of all genuine Church growth is the rightly divided Word of God. The truth of God’s Word is the only foundation for genuine fellowship and unity, because it is truth that defines love, grace, mercy, faith, fellowship, spirituality, unity, and reality itself. At that point in the history of the Church, “the apostles’ doctrine” (NKJV), which we see in Peter’s teaching that day, included the following basic truths that were later elaborated upon in the Church Epistles: (1) Jesus Christ was a man, the Son of God, the Savior, who has now been exalted to be the Lord; (2) People make free will choices, and God is not in control of everything that happens; (3) Death is real, and so is resurrection; (4) God is the Giver and holy spirit is His gift; (5) God’s grace and forgiveness are available to everyone; (6) salvation and speaking in tongues are real. (43) Everyone was filled with awe, and many wonders and miraculous signs were done by the apostles. (44) All the believers were together and had everything in common. (45) Selling their possessions and goods, they gave to anyone as he had need. (47) praising God and enjoying the favor of all the people. And the Lord added to their number daily those who were being saved. As those first Christians poured out their hearts and lives for the Lord and one another, the Head of the Body added members day by day. Not only that, he worked in each believer to transform him more and more into his likeness. Even without the revelation of Romans through Thessalonians, which would later serve to clarify, crystallize, and expand upon what they already knew, those first Christians turned their world upside down. If our heavenly Father is the same now as He was then, and if our Lord Jesus is the same yesterday, today, and forever, and if the Word of God is still as true as it was then, why should we not do likewise? Time is passing—let’s do it.